Air France and KLM’s Flying Blue loyalty program is a great option to score Delta One Suites using points, especially to Europe. One major reason? There are often transfer bonuses when you move credit card points into the Flying Blue loyalty program, which can mean suites to Europe for under 50,000 points one way. How To Create Flying Blue Miles: Flying Blue miles can be created by flying with all SkyTeam airlines, as well as transferring credit card points from: American Express, Citi, Chase, SPG and Marriott. There’s currently a 30% bonus when you transfer Citi Points into Flying Blue. How Many Points You’ll Need: Business class between the U.S. and Europe starts at just 59,000 FlyingBlue Points, which can be enough for one way in Suites. With the current 30% Citi Thank You Points transfer bonus to FlyingBlue, you could score Delta One Suites for just 46,000 points. How To Book Delta One Suites Using FlyingBlue: Easy. First, look up the current and future Delta One Suites routes here. Next, you’ll need a loyalty account with FlyingBlue, so you can use and transfer points. Once you have those in place, FlyingBlue offers a flexible calendar, allowing you to see up to a month of points availability at once, via this link. Confirm that dates and aircraft are correct, and enjoy! Virgin Atlantic and Delta continue to become BFF’s, with their joint business venture, and the love fest has given serious benefit to members of Virgin Atlantic’s Flying Club. By booking Delta flights using Virgin Atlantic Points, you’re able to save five digits on almost every single redemption, with some of the very best offers for both transatlantic and transpacific travel. How To Create Virgin Atlantic Miles: Virgin Atlantic Flying Club miles can be created by flying with their numerous airline partners, like Singapore, ANA, Virgin Australia and more; and also via spending on their U.S. or UK credit cards. You can also instantly create Virgin Flying Club Miles by transferring credit card points from: American Express Membership Rewards, Citi ThankYou and Chase Ultimate Rewards. How Many Points You’ll Need: Business class between the U.S. and Europe is just 50,000 points. Note, the UK counts separately, and presently doesn’t have Delta One Suites service anyway. The real stunning value is for travel between the U.S. and Asia, to destinations such as Tokyo or Shanghai which go for just 60,000 points one way in Suites. Conversely, Delta charges over 90,000 points for the same flights. How To Book Delta One Suites Using Virgin Atlantic: Easy. First, look up the current and future Delta One Suites routes here. Next, you’ll need a loyalty account with Virgin Atlantic. Once you have those in place, look up flight availability for the Delta One Suites routes on Virgin Atlantic’s website by selecting “book” and then “pay with miles” and book there as well. You can even call and waitlist flights while your points transfer from your credit card into Virgin. If you run into any issues, here’s a great guide. Confirm that dates and aircraft are correct, and enjoy! Korean Air offers one definitely great value, and if you have some patience, a scanner and enjoy telling funny stories about the lengths you go to for your points passion, you can pay just 80,000 points per person round trip for transatlantic business class suites. How To Create SkyPass Miles: Korean Air SkyPass miles can be created by flying with SkyTeam airline partners, like Air France, KLM and Vietnam. You can also (almost) instantly create Korean SkyPass miles by transferring credit card points from: American Express Membership Rewards, Chase Ultimate Rewards and Starwood, Marriott. How Many Points You’ll Need: Business class between the U.S. and Europe is just 80,000 points round trip, and you’ll need to book a round trip to lock in this offer. With increased routes to Europe featuring Delta One Suites, this is an increasingly tempting offer, even with surcharges of roughly $500 per ticket. Trust us, $500 for round trip Suites to Europe is pretty amazing. How To Book Delta One Suites Using Korean: This one isn’t quite as easy, but once you get the hang of it, it’s not so bad. First, look up the current and future Delta One Suites routes here. You’ll need to create a loyalty account with Korean SkyPass, which you can do here. Once you’ve got that done, your best bet is to search for available seats using the Air France FlyingBlue websites, looking for dates where prices using points are between 59,000 – 62,500 each way. Once you’ve done that, you can read through the lengthy process of actually booking here. Confirm that dates and aircraft are correct, and enjoy! How To Create Delta Skymiles: Delta Skymiles can be created by flying with Delta Airlines and their SkyTeam airline partners like Aeromexico, Korean Air France, KLM and Vietnam, as well as spending on the never ending arsenal of Delta Amex credit cards. You can also (almost) instantly create Delta Skymiles miles by transferring credit card points from the American Express Membership Rewards program or Starwood (SPG), Marriott hotel points. 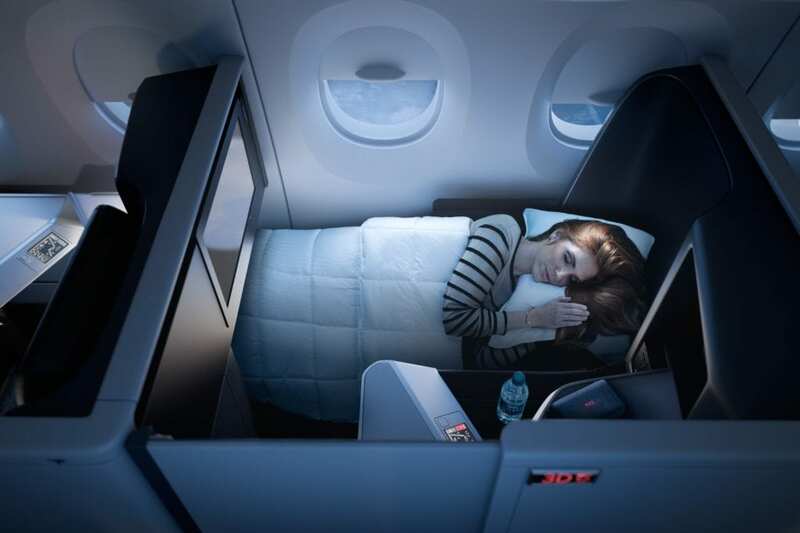 How Many Points You’ll Need: Business class between the U.S. and Europe is 85,000 points one way at the best of times, and transpacific business class is 90,000 points at the very lowest rates. For a round trip ticket to Europe or Asia, assume at lest 180,000 points per person, but with the added benefit of no surcharges, if your ticket originates from the United States. Delta does not publish a chart for how many points you’ll need, so this could change at any time. How To Book Delta One Suites Using Delta Skymiles: First, look up the current and future Delta One Suites routes here. Next, login to your Skymiles account at Delta.com and search for flights using “show price in miles”. Using the flexible “5 week” calendar tool will help bring up the lowest prices, and it’s almost always best to search one way at a time, even for a round trip. Have you booked Delta’s new suites using points? Try finding any availability in Delta One from the US to Asia ( i.e. ATL-ICN or ATL-NRT ) for under 300K miles ONE WAY!!! Delta is insane with the amount of miles they are currently requiring. Maybe if enough bloggers shame them they will behave better (doubt it!! ).